America started the Ukrainian crisis by trying to impose its will on the world, Russian President Vladimir Putin told Egyptian media. He added that the crises in Syria and Iraq were also fueled by Washington’s disregard for dialogue. The Russian president gave an interview to the Egyptian daily newspaper Al-Ahram in the run-up to his visit to the Arab Republic. Al-Ahram:How do you assess the current state of bilateral relations between Russia and Egypt following the revolutionary events in Egypt in 2011-2013? What is your vision of their prospects, particularly in light of the outcomes of the visit of Abdel el-Sisi, President of the Arab Republic of Egypt, to Russia in August 2014? 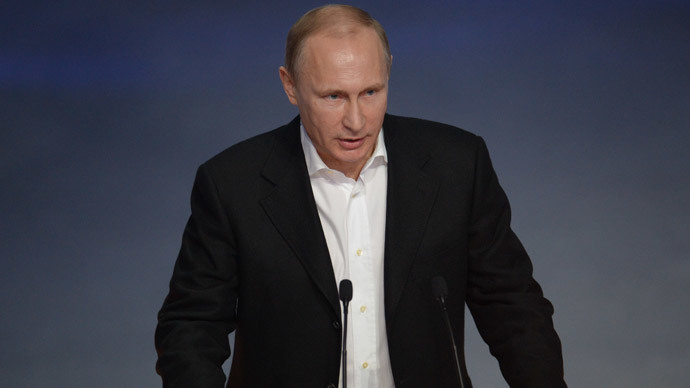 Vladimir Putin: Egypt is a long-time and trusted partner of Russia. The history of modern diplomatic relations between the two countries that dates back to the year of 1943 has been eventful and colorful. For more than seven decades, both our countries and the international arena have seen numerous transformations. And yet, our desire to work together towards the development of Russia and Egypt as well as ensuring international and regional security has remained unchanged. It was with the Soviet Union’s support that major economic infrastructure facilities were constructed in Egypt. These include the Aswan Dam and large enterprises such as the Helwan Iron and Steel Company and the Nag Hammadi aluminum smelter. We are glad that these industrial complexes continue to function effectively to the benefit of a friendly nation. As for the events of 2011-2013, we welcome the efforts of the Egyptian government and people aimed at strengthening the country’s internal stability, improving its political system and modernizing economy. We have treated with respect the expression of will by the Egyptian people in the course of the plebiscite held on the draft of the new constitution and the elections of the head of state. Despite all the difficulties Egypt has faced these past years, our countries managed to keep our bilateral dialogue multidimensional and multiformat. Our meeting with President el-Sisi that took place on August 12, 2014 in Sochi fully confirmed that. The meeting was very productive and useful. We have once again affirmed that Russia and Egypt share the same determination to further expand relations of friendship and equal cooperation. Russian-Egyptian relations are developing rapidly. The volume of bilateral trade has increased significantly over the past years: in 2014, it has increased by almost half compared to the previous year and amounted to more than $4.5 billion. Clearly, this trend needs to be strengthened. We see great potential for achieving results that are even more impressive. We have established mutually-beneficial and effective cooperation in the field of agriculture. Egypt is the major buyer of Russian wheat, Russia provides about 40 percent of grain consumed in the country; as for us, we import fruit and vegetables. Many Russian companies, including those of the fuel and energy sector, chemical or automotive industry, show interest in the Egyptian market. We see promising prospects in the field of high technology, particularly in the areas of nuclear energy, outer space use and sharing of the Russian GLONASS satellite navigation system. Egypt is also one of the popular vacation destinations for Russian citizens. By the end of 2014, we reached a record number of more than 3 million Russian tourists visiting Egyptian resorts, which is almost 50 percent more than in 2013. Russia highly appreciates Egyptian hospitality and those measures which are taken to ensure the safety of our tourists in the resorts of the Red Sea. I am convinced that a multifaceted dialogue between Russia and Egypt will continue to deepen and expand for the benefit of the peoples of our countries, for the sake of peace and stability in the Middle East and North Africa. Al-Ahram:How could you comment on the idea that is being actively discussed in Egypt to exclude US dollar and use national currencies that are rubles and Egyptian pounds for settlement of accounts in the bilateral trade? VP: This issue is really being actively discussed, primarily because the tourist season will begin in Egypt soon. Evidently, settlement of accounts in national currencies will contribute to creating more favorable conditions for millions of Russian citizens who annually spend their holidays in your country. Besides, this measure will open up new prospects for trade and investment cooperation between our countries, reduce its dependence on the current trends in the world markets. Therefore, it is quite natural that the business circles of both States raised an issue of advisability of using national currencies for bilateral payments. I should note that we already use national currencies for trade with a number of the CIS States, and China. This practice proves its worth; we are ready to adopt it in our relations with Egypt as well. This issue is being discussed in substance by relevant agencies of both countries. Al-Ahram:To your mind, what are the possible ways of interaction between Russia and Egypt in the context of the prompt political settlement of the Syrian crisis? VP: The approaches of Russia and Egypt to the situation in Syria are similar. Our States advocate the unity and sovereignty of Syria, consistently stress that there is no alternative to political and diplomatic settlement. We have a similar vision of the initial measures to be taken to settle the Syrian crisis. They include, first of all, launching an inter-Syrian dialogue without any preconditions and foreign interference on the basis of the principles outlined in the Geneva Communiqué of June 30, 2012. Cairo is hosting meetings of the Syrian opposition aimed at creating a common platform which could be used at the negotiations with the Syrian government. A consultative meeting of the representatives of various Syrian opposition groups, civil society and the delegation of official Damascus recently took place in Moscow. Evidently, Russian efforts and the activities of the Egyptian partners complement each other and are aimed at overcoming the standstill in the political settlement of the Syrian crisis. We also should help to launch a dialogue between the Syrian government and its political opponents so that they can find mutually-beneficial compromises and solutions themselves without any foreign pressure. We discussed it in detail with President el-Sisi at our meeting last year in Sochi and we are also going to discuss this issue in substance in Cairo. The foreign policy services of our countries also interact closely. Al-Ahram:In recent months we have seen a serious deterioration of the situation on the Palestinian territories. Please describe what Russia is doing to de-escalate the tensions and to settle the Palestinian problem. VP: After a nine-month round of Israel-Palestine negotiations, held under the auspices of the USA, ended unsuccessfully in April 2014, relations between the parties have noticeably worsened. In summer, a bloody conflict between Israel and the Gaza strip broke out. In autumn, the unrest began in Jerusalem, caused, inter alia, by religious contradictions. Israel has simultaneously boosted settlement activities. Taken as a whole, this led to the aggravation of the situation in the whole Middle East and is fraught with further escalation of tension. The Palestinians seem to have lost their faith in a possibility to reach a compromise with the Israeli government in that situation. So they submitted to the UN Security Council a draft resolution on the parameters of a peaceful settlement. I would like to note that Russia voted in favor of this document together with some other members of the UN Security Council. However, it did not receive the required majority of votes. Of course, the unceasing conflict cannot but worry us. That is why we remain in regular contact with senior officials in Palestine and Israel. We urge both parties to make concessions to each other and to search for common ground in order to normalize the situation. We will further pursue this policy, both through bilateral channels and on various international platforms, first of all within the framework of the Middle East Quartet of international mediators, the activities of which should be intensified. We also consider it important to ensure close coordination of the Quartet's efforts with Egypt and other Arab countries. Al-Ahram:What measures does Russia take in order to settle the problem over the Iranian nuclear program? VP: I can say with no exaggeration that Russia makes a significant contribution to the settlement of the situation around the Iranian nuclear program. Our position is based on a belief that Iran has a right to peaceful nuclear activity including uranium enrichment, naturally under control of the IAEA. It was not an easy task to convince our partners from the P5+1 to agree with this approach. At first, we continuously asked all the parties involved to sit down at the negotiating table and start a serious discussion of the ways to resolve this problem. We tried to convince them that there was no alternative to the political and diplomatic settlement. Then, we proposed a conceptual framework to advance along this way – the principles of the stage-by-stage movement and reciprocity. And such an approach was supported by all the participants in the process. The negotiations are well under way now. Substantial progress has been made. However, we have not managed yet to produce a final comprehensive solution either regarding the Iranian nuclear program itself or the prospects of lifting the sanctions. We expect the efforts in this field to be continued. The crucial point is that nobody should try to derive unilateral benefit from the situation or to bargain out more than what is needed for a balanced and just resolution of this complicated issue. Al-Ahram:The terrorist threat, including that posed by the ISIS, is one of the most dangerous challenges that the countries of the Middle East and the international community as a whole are faced with today. What do you think about the future of cooperation between Russia and Egypt in addressing this threat? VP: The challenge posed to the international community by the Islamic State terrorist group is unprecedented. In essence, the terrorists are trying to gain control over a huge part of Iraq and Syria with a population of nearly 10 million. And they already threaten countries which are far from the Middle East region. We have witnessed this in France, Australia and Canada. Today’s developments in Syria and Iraq stem, among other things, from a heavy-handed and irresponsible interference from the outside into the affairs of the region and unilateral use of force, ‘double standards’, and differentiating between ‘good’ and ‘bad’ terrorists. Regrettably, we must note that the actions being undertaken today by the members of the anti-terror coalition, their strategy and tactics are disproportionate to the scale and nature of the existing threat. Airstrikes alone are not enough to deal with it. What is more, such actions lack legitimacy since they were not directly sanctioned by the UN Security Council and in certain cases are taken without the consent of states whose territories are being targeted by strikes. Unlike Iraq, where the fight against terrorism is conducted in cooperation with the officials in Baghdad, in Syria the coalition refuses to work together with the legitimate authorities. Russia advocates the consolidation of efforts taken by the international community to fight terrorism on the basis of international law and respect for the sovereignty and territorial integrity of all states. We are interested in developing relevant cooperation with friendly Egypt, both at bilateral and international level. The more so since both our countries have been repeatedly attacked by terrorists. Al-Ahram:How would you assess the situation in Ukraine and around it? What do you think will be the most appropriate way out of the Ukrainian crisis? VP: I would like to remind Egyptian readers that the Ukrainian crisis was not caused by the Russian Federation. It has emerged in response to the attempts of the USA and its Western allies who considered themselves ‘winners’ of the Cold War to impose their will everywhere. Promises of non-expansion of the NATO to the East (given yet to the Soviet authorities) have turned out to be hollow statements. We have seen how NATO's infrastructure was moving closer and closer towards Russian borders and how Russian interests were being ignored. Moreover, in the framework of the EU Eastern Partnership Program there have been attempts to tear states which were parts of the former USSR off Russia and to prompt them to make an artificial choice "between Russia and Europe." The Ukrainian crisis has become a high point of these negative trends. We repeatedly warned the USA and its Western allies about harmful consequences of their interference in Ukrainian domestic affairs, but they did not listen to our opinion. Last February, the USA and a number of EU member states supported the coup d’état in Kiev. The ultranationalists who seized the power using military force put the country on the edge of disruption and started the fratricidal war. Unfortunately, today we can see how the ‘war party’ in Kiev actively supported from the outside continues its attempts to push the Ukrainian people over the edge of a catastrophe. The situation in Donbass has aggravated dramatically. Ukrainian security forces resumed the bombing of Donetsk, Lugansk and other residential areas in the region. They are building up their military presence there. The 'new wave' of mass mobilization has been announced in the country; there are calls for 'taking revenge' after summer's 'military failures' and for a forceful 'Ukrainization of Donbass'. Ukraine is militarizing rapidly. We can judge by the statistics: in 2014, the Ukrainian military budget increased by almost 41 percent. This year, according to preliminary data, it will more than triple and reach more than $3 billion – which is about 5 percent of the country's GDP. And this is happening when its economy supported mostly with international, including Russian, funds is in rather deplorable situation. The most important condition for the stabilization of the situation is immediate ceasefire and ending of a so-called ‘anti-terrorist’, but in fact punitive, operation in the southeast of Ukraine. Kiev's attempts to exert economic pressure on Donbass and disrupt its daily life only aggravate the situation. This is a dead-end track, fraught with a big catastrophe. In the meantime, it is necessary to do one's utmost to make all the parties to the conflict gather around the negotiating table. In this context, the Russian side stands for forging sustainable and direct contacts between Kiev and Donetsk and Lugansk, for continued work within the Contact Group. On our part, we intend to actively contribute to that process. Al-Ahram:To what extent has the drop in global oil prices influenced the state of Russian economy? In your opinion, what effect will this phenomenon have on the Middle East countries, global economy as a whole? VP: Russia is an active participant in the global economic relations. And, of course, Russian economy is affected by sharp fluctuations in the global economic situation, especially such as a 50 percent plunge in oil prices. For Russia, as one of the world's largest oil-producing countries, it means certain problems related to budget revenues, state spending on economic growth and implementation of oil companies' investment programs. At the same time, I would like to underline that it is not the first time we have faced such problems. We have the experience of overcoming the previous crisis of 2008–2009. Just like then, Russia has accumulated substantial reserves which enable us to cope with the effects produced by negative factors. The government has adopted a large-scale plan of actions to ensure sustainable economic development and social stability. It includes support for the real sector of economy and systemically important credit institutions, employment promotion and assistance to small and medium-sized businesses. We will optimize budget expenditures and monetary policy. As for the Middle East region, where oil-producing countries have traditionally been playing a significant role, current oil prices are also having an evidently negative effect. Budgets of many countries were drafted on the basis of oil prices that were higher than the current ones. What is more, the region is facing new challenges and an adequate response to them will require additional resources. This is why in the Middle East there is a growing understanding that the oil market should be stabilized and demand balanced with supply. After all, what is the major risk posed by dropping oil prices? It is that the oil and gas industry becomes less attractive for investors. They have to abandon developing technologically complex oilfields and infrastructure development projects, and, as a result, oil supply on the market will gradually but inevitably shrink. It means that at some moment there may be a powerful price correction in the opposite direction that will mean a real economic shock. Such disturbances do not benefit anyone – neither oil producers, nor consuming countries or the global economy as a whole. I would like to stress it once again: a predictable and stable energy market serves the interests of all countries. This is why in the current situation it is necessary to combine the efforts of responsible actors of the global oil market to create conditions for its steady long-term development.